Happy Tuesday!! A lot of you know that I’ve been doing a workout program called BBG for the past twelve weeks (and I actually just started it again!! Round two!!) and I’m amazed at how life changing it has been for me. Not just physically but mentally as well! It has been so neat to see what my body can do and how far I can push myself. Along with working out Drew and I have made a goal to only eat out on the weekends (or just twice a week). 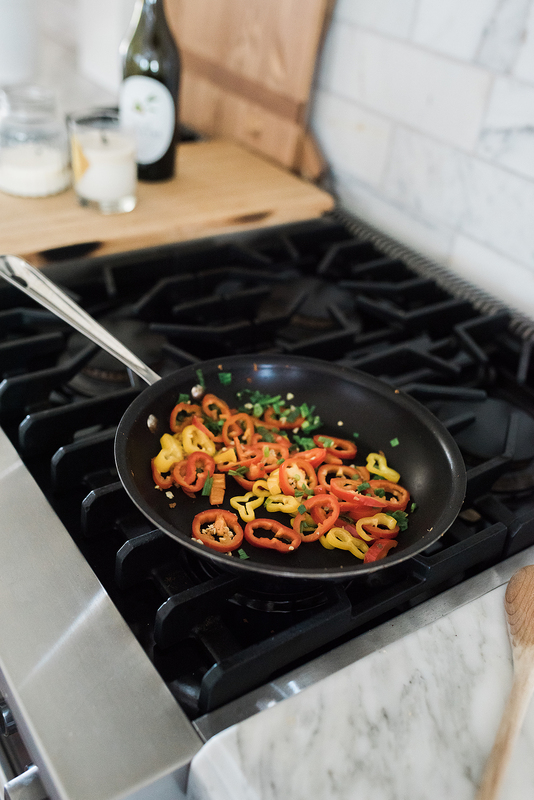 We’ve been really trying to cook and eat at home for health and budget reasons. Plus let’s be honest, it’s usually a disaster to try and go out to eat with my babies (and sometimes even just a quick trip to the grocery store to find ingredients for meals is an adventure!!!). 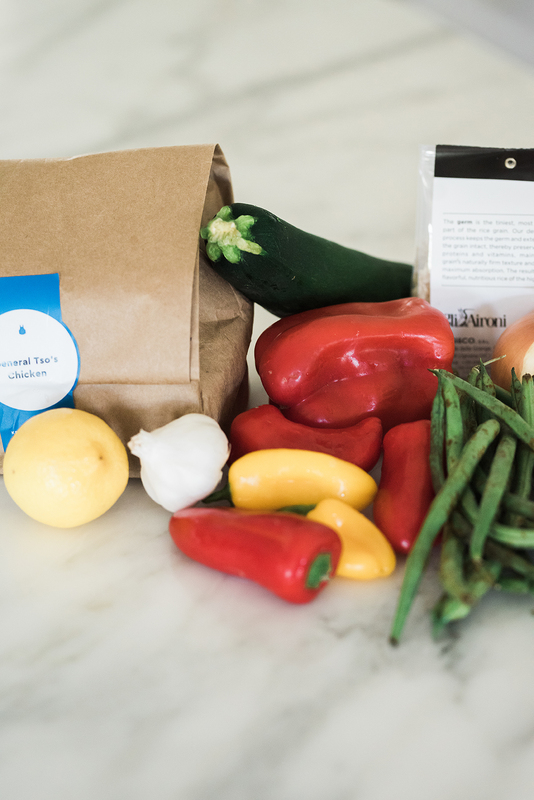 I last posted about Blue Apron in this post, but last week we got a delivery and we were pretty excited about it! I love Blue Apron’s food service because it makes cooking dinner simple and fun with unique meals I could never come up with on my own! 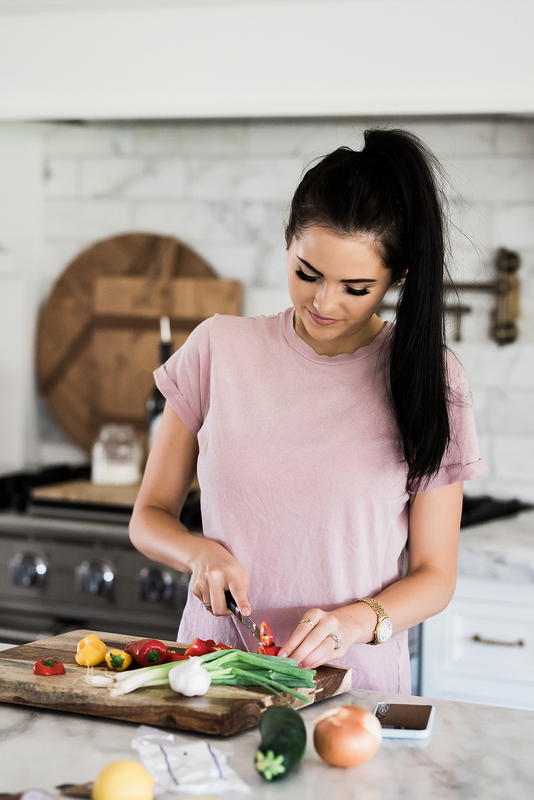 The recipes along with farm-fresh ingredients are delivered in a refrigerated box straight to your doorstep in the right proportions (whether you are doing a 2-person plan or the family plan). 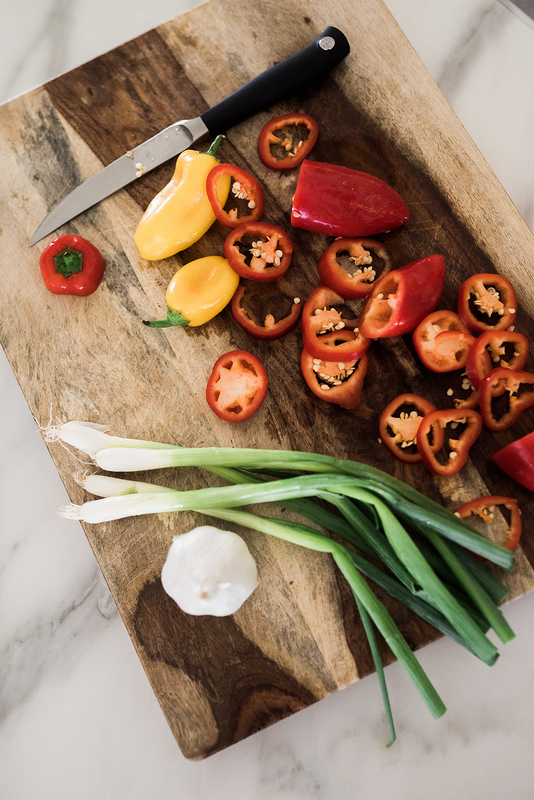 Each menu is between 500-800 calories per person and can be prepared in less than 40 minutes (click here to see all of their delicious dishes that are available!!). 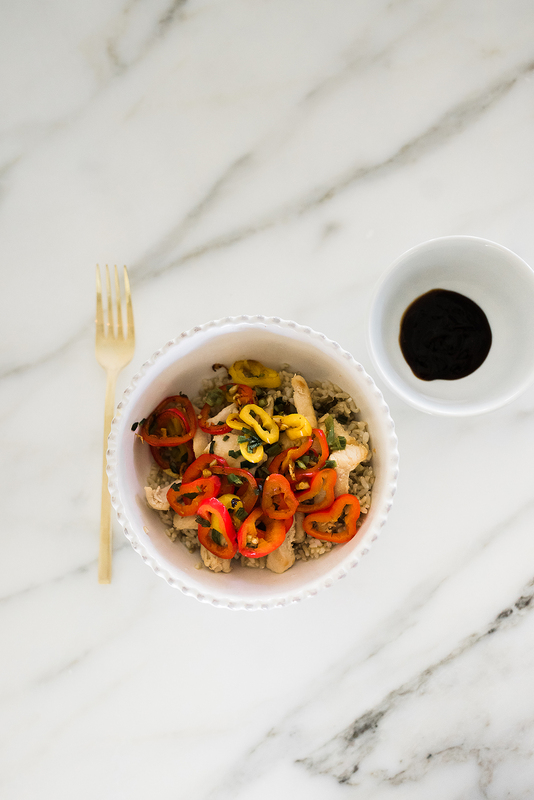 On the menu for this meal was General Tso’s Chicken with sweet peppers and jasmine rice. It had all the right flavors of sweet, spicy and nutty and Drew and I loved it (I chose to have the sauce on the side to go along with the meal plan I’m doing). 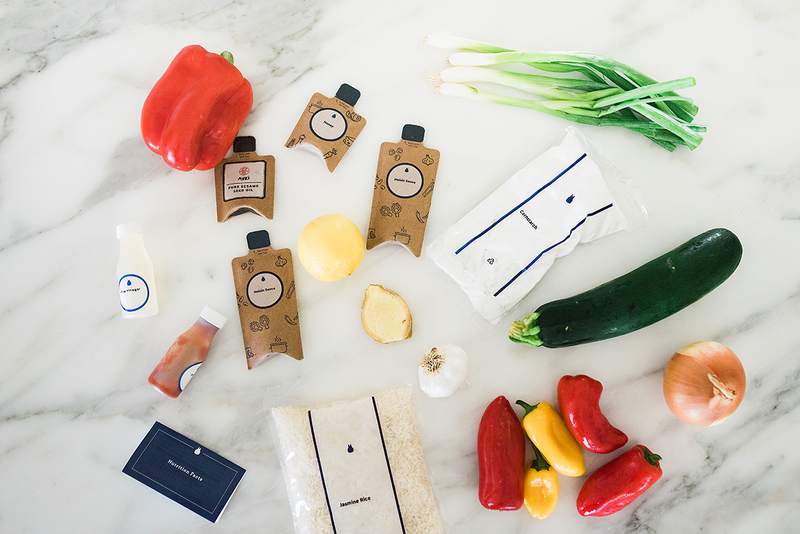 If you’ve been wanting to give Blue Apron a try now is your chance!!!! They are offering three free meals to the first 100 readers who sign up. Click here to redeem the offer! Happy cooking! Love Blue Apron! 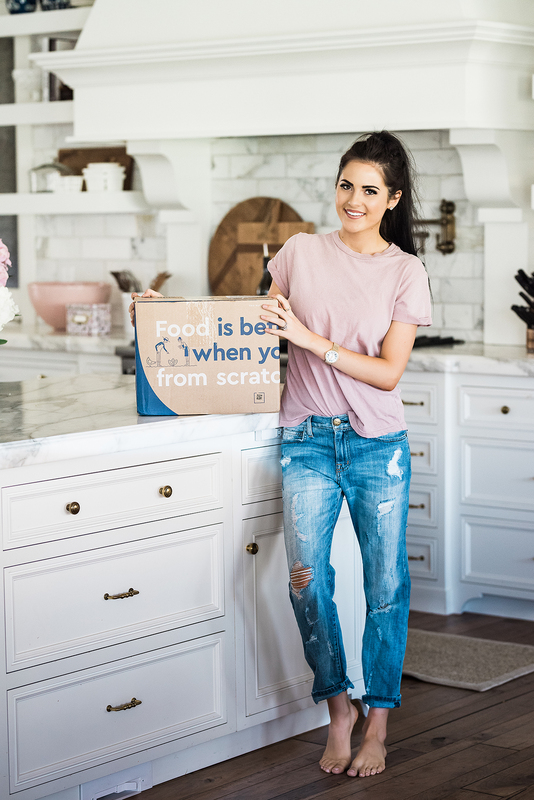 I use their service all the time and their meals are delicious and easy to make! I’m on BBG week 9 and really, really like it! I love how short the workouts are. You look great. So cute seeing Isla cooking with you. My kids love to help out in the kitchen! I’m probably one of the last people to try out a meal delivery system but keep wanting to try one out. 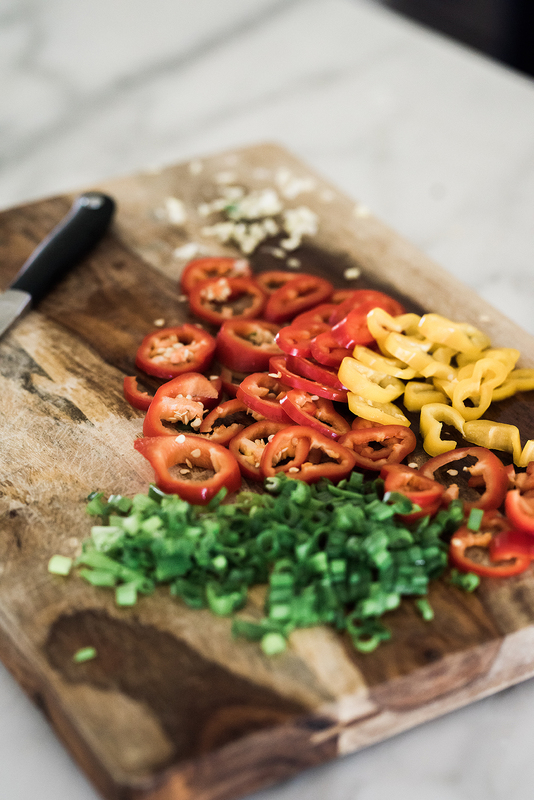 We love to cook at home and the idea of having ingredients delivered and having new recipes to try sounds great. I love to cook at home. It definitely saves money, but also helps you know exactly what you are putting into your body. I definitely need to try Blue Apron! I love cooking but there are some nights that I just need it to be a little less work. love blue apron! great recipe! It is always pleasing to make my kitchen an interesting place. This is the place where we have to make food. food cooked with positive mindset have impact on our food, which have impact on thought while eating. This looks so yummy! Keep up the awesome work girl! Trying to find your motivation! Love Blue Apron! They make things so easy and simple! That looks so delicious! I love Blue Apron. Also, have you tried BBG stronger yet? I LOVE BBG and need to get back into it. Is the meal plan associated with BBG the one you are referring to? Love the idea of a designed menu. 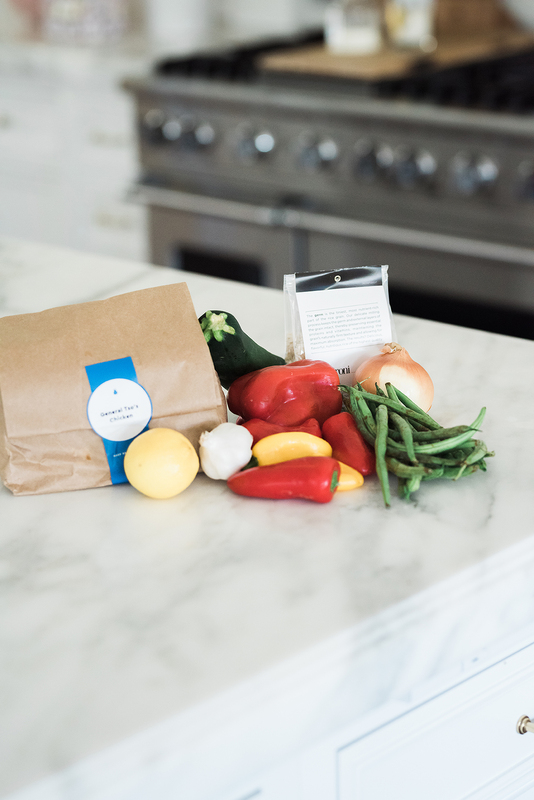 I love Blue Apron and like the simplicity of their meals. Stunning pictures as always! I have been dying to try Blue Apron! I always see my neighbor’s box by the mail and can’t help myself but wonder what is in there? Haha. Looks so delicious! I am so surprised I scored the offer from Blue Apron, thank you so much. I recently discovered your blog and I have enjoyed following it ever since. Our style and tastes are very similar and I enjoy drawing inspiration from you. Thanks for the great posts and again for the awesome offer from Blue Apron. I will have to give this a try! 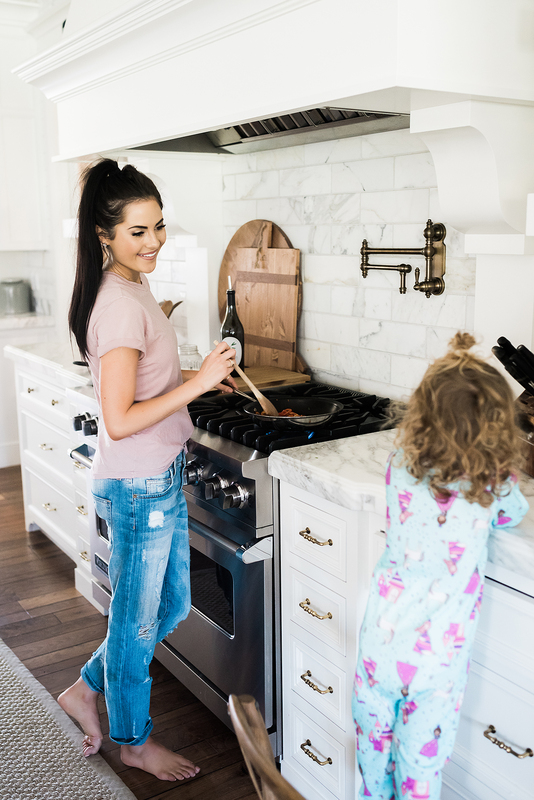 Also, your kitchen (or really just your entire house) is goals. Love this outfit too! I have been wanting to try blue apron. I need to give it a try. 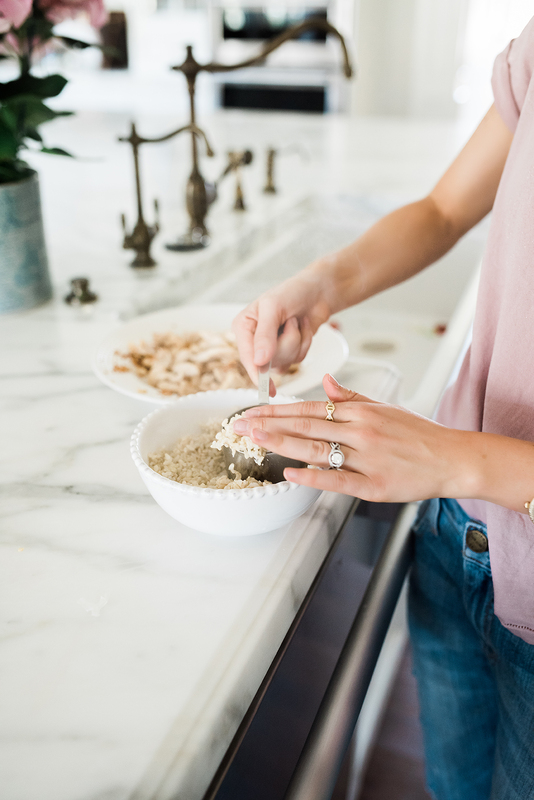 I’ve definitely been thinking about one of these meal services, especially for just me and my husband as the kids get older and busier. It’s good to know that you can select portions and how big they are! We love Blue Apron in our house! You look beautiful in these pictures BTW! 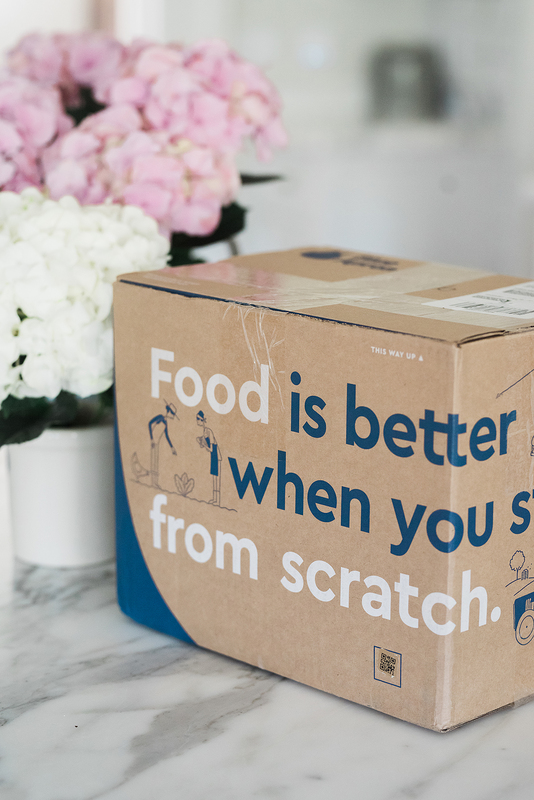 I love Blue Apron but sadly, I’m from South America! We need a service like this here! We love Blue Apron at our house too! Hi!! I love your jeans. Could you please let me know the brand and the style name of your jeans? Thank you!! I’ve been wanting to try them out. I’ve heard great things about them. Maybe I’ll go ahead and give them a try. Thanks for the post! Wow – you look amazing! I’ve been curious about BBG, but haven’t tried it. Will you do a post on your results and what you like about it? Yes I will!!! I’ve been working on a post :) So stay tuned! Yum Blue Apron! However, I am more curious about those PERFECT COMFY WEEKEND BOYFRIEND JEANS you are wearing!!!! Can you do an IG post so I can “swipe up!!! !” Thanks! H! Haha thanks Hollie!! They are actually super old! But if I find them online I will totally do a swipe up! They’re old! But if I find them online I will definitely do a swipe up! This would make weeknight meals so much easier for myself and my fiancee! HI, I LOVE YOUR KITCHEN AND WOULD LIke to know where you got the cabinet hardware from?